The primary function of the Geophysics Subdivision is to provide geophysical data to research institutions and the exploration industry. 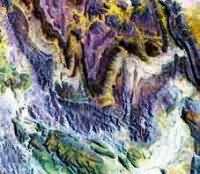 These data reveal geology in the vast areas covered by young sediments and allow insight into deeper geological structures. The Regional Airborne Geophysical data set comprising Magnetics (85% coverage), Radiometrics (40% coverage) is supported by approximately 13000 Gravity ground stations. To support new airborne geophysical surveys in the region comprehensive Radiometric Calibration Facilities are offered by the Geological Survey. 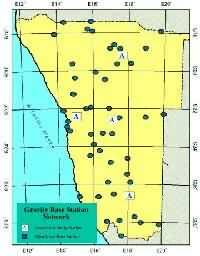 Some 41 different surveys flown between 1962 and 1992 were homogenised and merged within the framework of technical co-operation between the Geological Survey of Namibia and the Bundesanstalt für Geowissenschaften und Rohstoffe (BGR), Germany. Data are available as whole area grids with 2000 m, 500 m and 200 m cell size and scissored according to the Namibian Map System in 1:250.000 map sheets (500 m cell size) and 1:50.000 map sheets (200 m cell size). 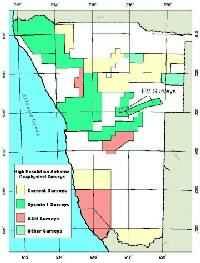 Within the framework of technical co-operation between the Geological Survey of Namibia and the Bundesanstalt für Geowissenschaften und Rohstoffe (BGR), Germany, data were back-calibrated covering an area of 11 1:250.000 map sheets. To merge different surveys of varying quality, the data had to be back-calibrated using ground control points. Counts per second were transferred into ground concentrations of the three radioactive elements Potassium, Uranium, Thorium and into Exposure Rate (Total Counts) using calibrated hand held 256 channel spectrometers. These data are available in gridded format scissored according to the Namibian Map System as 1:250.000 map sheets with 250-m grid cell size. More than 13.000 gravity stations are currently held by the Geological Survey. To improve data density a gravity programme will be launched in mid 2000 aiming at coverage of one gravity station per 10 km2. Stations will be linked to a base station that is in turn connected to four absolute gravity stations established by NIMA in 1997. Click on image for a 108Kb image of regional gravity map. In 1994 the Geological Survey embarked on a programme of High Resolution Airborne Geophysical surveys comprising 200 m line spacing and a ground clearance of 80 m to 100 m. To date over 1 million line-kilometers of data are available and a contract for a further 750 000 line-kilometers is currently in progress. Further surveys are planned for this year and in following years to achieve complete national coverage by 2008. Digital data are available in gridded format and as located line data to allow custom tailored reprocessing and line data interpretation. These data are sold on a 1:50.000 map sheet base for 1 N$ per line-km. Radiometric surveys have become increasingly important for mineral exploration and environmental studies, especially since data quality is improved by modern spectral processing. The calibration of airborne and ground instruments, making use of calibration pads and a Dynamic Calibration Range, is essential to achieve comparable results in units of ground concentration. Calibration pads are available at the Eros Airport close to the Geological Survey in Windhoek. 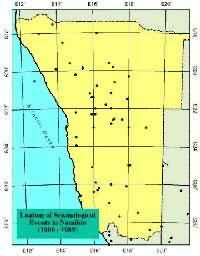 The Dynamic Calibration Range is situated close to Henties Bay at the central Namibian coast. The area meets the criteria defined by the IAEA in 1991. The range consists of a flat 2 x 11 km wide area stretching approximately 1 km inland along the coast, that was surveyed on a 100 x 100 m grid using calibrated hand held instruments. A nearby airstrip and the airport of Swakopmund, 60 km to the south, complete the facilities. Digital data and hardcopy maps of the Dynamic Calibration Range can be made available to all interested parties. The Tsumeb Station monitors seismic activity as part of the Global Seismological Network (GSN), funded and operated by the Incorporated Research Institutions for Seismology (IRIS - a consortium of 80 universities in the USA) in co-operation with the United States Geological Survey (USGS). A second station will be established in Windhoek shortly. Other joint research ventures include monitoring magnetic secular variation in co-operation with the Hermanus Observatory, South Africa and neutron emissions in conjunction with the University of Potchefstroom, South Africa. A site survey for an Infrasound Station was completed in February 2000 and if suitable a permanent station will be established by the Comprehensive Test Ban Treaty Organisation (CTBTO), Vienna, Austria.